lived these things for nine months: our Blessed Mother? Through our Lord Jesus Christ … and ever. Amen. TO BE PREGNANT WITH JESUS. in a way beyond all telling. formed the Creed and other dogmas. knowledge of these sacrifices helped her accept her Son’s self-sacrifice as she stood beneath His Cross. 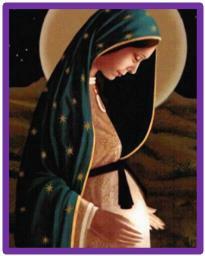 that we, who commemorate in faith the Mother of your Son, may be saved by his Incarnation. WILL YOU CELEBRATE THE INCARNATION? While Christmas means many things, it is, above all, the mystery of the Incarnation: God became a man, born of a Virgin, who totally gave herself to the Lord to make God’s plan a reality. How can we give of ourselves so God’s plan to save the world through Christ becomes a greater reality through us?